A US Coast Guard helicopter crew medevaced a man from the "Celebriy Summit" approximately 230 miles east of Cape May, New Jersey, in the afternoon of Aug 27, 2018. Watchstanders at the 5th District command center were notified in the morning that a 61-year-old male crew member was suffering from symptoms of a heart attack and needed medical assistance. The watchstanders directed the ship to change course towards shore to conduct a medevac. The Air Station Atlantic City launched an MH-65 Dolphin helicopter crew to medevac the man. Air Station Elizabeth City launched an HC-130 Hercules crew to provide support to the helicopter due to distance offshore. After arriving on scene, the helicopter landed on the cruise ship helicopter pad and recovered both the crewmember and a nurse. They were transported to the Atlanticare Regional Medical Center in Atlantic City, New Jersey, for additional care. 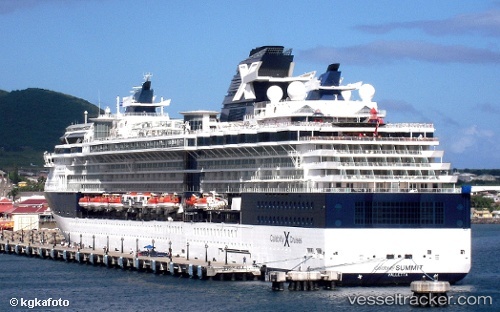 A medical emergency aboard the "Celebrity Summit" resulted in a 13-year-old boy being brought ashore for treatment early on Aug 22, 2018. The passenger was believed to have suffered a brain embolism. The vessel, which was 150 miles northwest of Bermuda, arrived early in the morning, and the patient was brought ashore to St David’s at 1.25 a.m. He was taken to the King Edward VII Memorial Hospital for treatment.